Our new president Jim Sawatzki will chair his first meeting on Saturday March 11th.Please attend so you can meet him. This is his second presidency, he first served in 2009/2010, was the previous caretaker of the art house and chaired the scholarship committee. Saturday, March 11 at the Mountain Community Mennonite Church starting 9:00 with social gathering and snacks, 9:30 business agenda. What’s the difference between turpentine, mineral spirits and turpennoid? First, all three can cause serious reactions. Turpentine, mineral spirits and turpenoid can cause skin, eye, mucous membrane, and upper respiratory tract complications. Taking out the odor in all three doesn’t mean the danger is gone. It just implies a nasty headache isn’t experienced using these solvents. Turpenoid is an odorless turpentine substitute that is a refined and filtered solvent suitable for oil painting. Odorless mineral spirits does the same thing, but it has impurities. However, if you’re allergic to turpentine, then odorless mineral spirits is probably your only choice. Keep in mind that the expensive turpenoid if not properly used such as dipping the paint brush into a dirty jar of turpenoid will result in an impure application. Keep one jar of solvent on hand for washing brushes (OMS) and the other for actual painting. Always keep the jar with turpenoid for painting as clean as possible. What exactly is Alla Prima? It means at the outset, an Italian term for the approach of painting using glazes, scumbles and other techniques. Generally, any painting that is approached loosely is categorized as alla prima painting. Thicker and lighter passages that define the essence of pictorial expression are characterized as alla prima, an opaque application of paint. A scumble is an application of semi-transparent color and a glaze is an application of transparent color. Flemish painters used all three applications that were completed at one sitting. (wet on wet/alla prima) Contrasts were used extensively with the Dutch masters from thick and thin, opaque and transparent, warm and cool and light and shadow. Are there dyes in oil and acrylic paints and what are the biggest differences in these mediums? The answer is yes, but it’s almost impossible to decipher which brands and what pigments are affected. Dyes have been used for inexpensive substitutes for some of the more expensive, intense, and opaque colors of mineral origin; such as the cadmium yellows, reds and oranges. Adding dyes can fortify the intensity of color pigments. The thalo colors are a synthetic green pigment from the group of phthalocyanine dyes that allow a high intensity and bright color used in oil and acrylic based paints. Acrylic and watercolor paint evaporates, oil paint oxidizes. All paints begin with dry powdered pigments and contain liquid vehicles called binders. Linseed and poppy oil are used as binders for artists’ oil colors. Acrylic paints are made with acrylic polymer (plastic) resins dispersed in water. Watercolor binder is made with a gum arabic solution. The pigments contain coloring substances of organic or inorganic origin and many of the powdered pigments are synthetic. The permanence of a pigment is determined by its resistance to fading when exposed to direct sunlight. Neutral colored powders in oil colors, called inert pigments have been colored with organic dyes. These are called “lakes” from the term “lac” a blood red dye from India. One word of caution: Labels on the tubes of paint do not specify insoluble or non-bleeding pigments or soluble dyes. PLAG has received a $1,600 donation from Mr. Charles Marshall in memory of his wife, Lou Marshall, who passed away last year. She was an excellent painter and won a blue ribbon in a PLAG Show in 1991. The Gallery Committee will recommend to the membership how the funds might be used to meet Mr. Marshall’s interest in furthering art and artists in the community, including PLAG members. 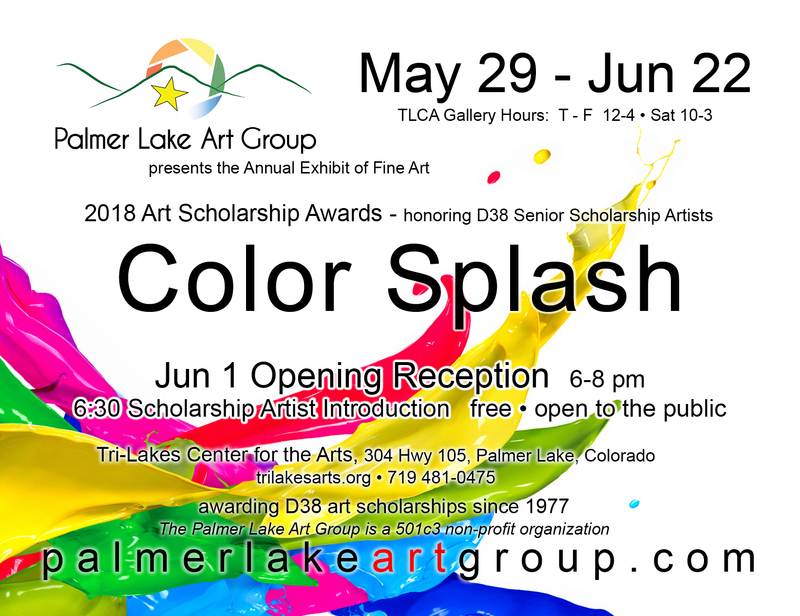 Get ready for the upcoming June Show: PLAG’s Color Splash of the year. Entry forms available soon! Current Photography Exhibit at TLCA:: Vision of Light Reception: Friday, March 3rd, 6 – 8pm. Show runs through March 24th. The meeting was called to order at 9:30 am by President, Cindy Tafil. Board members present were Susie Arnold, Margarete Seagraves and Carolyn Stolz. Thanks to everyone who brought food this morning. A motion to approve Today’s agenda was carried. There was no meeting in January, therefore, no minutes to approve. Treasurer’s reports were approved by membership. Reminder: Pick-up date for your art work from Tri-Lakes Center for the Arts is Saturday, February 25th from 10am – 12pm. Cindy asked for volunteers for pick-up. Cindy Tafil brought up that members no longer will need to bring food for the shows at TLCA, as they have a caterer for all their events. Nancy Moeglein’s daughter has died. A card from PLAG has been sent. Patty Hilbert was in the hospital recently and is recovering from pneumonia. Irmi Knoth will be having knee replacement this month. We’re glad Mary Krucoff is recovering from breaking her arm and was able to attend the meeting. A motion was made to approve Jim Sawatzki as our PLAG president for this year. Motion was carried. Jim is a past president in 2010. We appreciate his volunteering for this job. Cindy will continue as Chairperson for all the shows in 2017. We are grateful for all her work as our president. Rikki Stiltner was nominated & approved as vice president for 2017. Input from membership was discussed regarding programs for 2017. Please sent your ideas to the Art Committee/Board members. Cindy Tafil discussed workshops which will be further discussed at the Art Committee’s next meeting. There is money available to pay to have professional artists come to us and instruct workshops. Irmi Knoth would make her studio available for workshops. Marcie Edwards suggested Kay Liggett be called. It was discussed to reduce the number of workshop, i.e. doing 6 versus 11 in a year. Also, we will have 3 shows this year: Winter, Spring & Craft shows. Evalina Stoyanova, chairperson, has reserved the Palmer Lake Townhall for the first weekend in October. She is working on entry forms. A vote was taken and approved to not have a meeting in January each year. We will have a pot luck again in July at John DeFrancesco’s. Cindy Tafil suggested that she would like to see that PLAG is more active this year with the Tri-Lakes Chamber of Commerce by attending Chamber events and having a presence. She suggested that there is value in networking at these events. We need volunteers to attend. Susie Arnold reported that PLAG business cards are done & available to hand out. PLAG will also pay any costs for members to attend events. Donna Arndt reported that the Chamber has a “mixer” every third Tuesday of the month that we could attend. It also has breakfast meetings on occasion. Jim Sawatzki will get emails from the Chamber on events, etc. Claudia Dimidik suggested that a group go regularly to the events. The Chamber also has a quarterly luncheon. Lynn Roth suggested that we have a reminder in our monthly newsletter regarding activities at the Chamber. John DeFrancesco reminded everyone that input for the monthly newsletter needs to be sent to Margarete by the 24th of the monthly deadline. John also brought up the Tri-Lakes Women’s Club which has an event in early May every year. This event has been primarily an antiques show in the past, but now includes arts, crafts and other expanded interests. Space is available. Bonnie Biggs is the contact person to reserve booth/table space. Irene Pallon will call Bonnie Biggs regarding a PLAG table. Cindy suggested we could display our PLAG business cards, brochures at these kind of shows. A PLAG booth for this event was voted on and approved. We will need volunteers to man a table for the two-day event. This will be discussed at the next Art Committee meeting. The Art Committee meets on Mondays after the regular monthly meeting. This meeting is open to all members and are encouraged to attend. Irene Pallon has volunteered to be our publicity chairperson for 2017. Susie Arnold reported that PLAG was in receipt in January of a $1600 gift which we received from Charles Marshall in memory of his wife who recently passed away. She was an outstanding painter. He requested that the money be used for scholarships for PLAG members to attend workshops. He also wants it to be used toward awards for winners at our June show and as incentives for artists to expand their talent. Cindy suggested that the Art Committee can decide how the money will be awarded. It was also discussed that we have approximately $48,000 in the bank from the sale of the Vaile Gallery. We could take an amount each year to do cash awards, as well as student scholarships. Cindy asked that members email her with ideas of how to use the money; how to use it as incentives to attract more membership to our group etc. Irmi Knoth suggested chartering a bus to Denver to see the Denver Art Museum shows. PLAG ROSTER: Susie Arnold will have a current/updated membership list at next month’s meeting. Photography Show: Lynn Roth reminded everyone that there will be a photography show at TLCA following the PLAG show. Art Committee meeting Monday, 2/13/17, 10 am at MCMC. All members welcome to attend. Please submit your requests to be printed by the March 25th or earlier. Thank you!